Why Chose Alleviation Pest Control? Located in the Maryland, our pest control specialists have the training, experience, and resources to assure protection and elimination of all types of destructive pests. 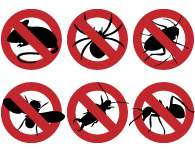 We're experts at the proper, proven methods of controling and erradicating pests. We provide effective, prompt service at a reasonable cost. We go above and beyond to see our customers' needs are met. We make sure you receive immediate, courteous help. We set and keep appointments and are flexible to our customers' changing schedules and requests.